Place lighting fixtures on either side of your mirror to cast more even light. Many homeowners overlook the need to invest in quality bathroom lighting–save it for the living room or kitchen, they say. This ends up leaving a lot of bathrooms with inadequate lighting. And yet, bathrooms are increasingly becoming a personal space for rest and relaxation. Better lighting is necessary to make this space feel comfortable. After all, the bathroom is where most of us start and end our day. If you’re planning to remodel your bathroom, carefully consider how you will choose to illuminate your space. 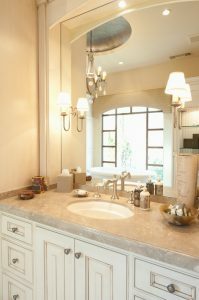 Task lighting, or the light by which you can best see yourself, is incredibly important for your mirror and vanity area. People commonly make the mistake of placing recessed lighting fixtures directly above a mirror, which ends up casting shadows on the face and making your daily grooming ritual that much more difficult. A better strategy is to place vertical fixtures or sconces on either side of the mirror, that way a more even light is cast across your face. In bathrooms with taller ceilings, cove or cantilever details, ambient lighting fixtures can be installed along the perimeter to serve as fill lights. You can utilize architectural details such as decorative molding to hide lights and give your bathroom a soft glow. This is especially useful if your bathroom has little to no access to natural light. If you’re one to showcase decorative art, use recessed direction lights to provide focused illumination and make these bathroom features stand out. You can also using accent lighting to highlight things like a powder room basin or a sculptural bouquet of flowers. Angle a recessed shower fixture to show off your bathroom’s nice tilework. Halogen bulbs set the gold standard for bathroom lighting, as a crisp white light renders skin tones most accurately. You can find compact, low-voltage varieties that give a nice sparkling effect. The newest fluorescent bulbs also offer decent color rendering while also being 10 times more energy efficient than typical incandescent bulbs. That said, LED lights are the kings of efficiency, and can last up to three times longer than compact fluorescent lights. Originally only used for task lighting because of the harsh, direct light they provide, LED technology has come a long way and now offers the same look as incandescents. Dimmers are another frequently overlooked feature that is excellent for bathrooms. Not only do dimmers help save energy, but they’ll give you significantly more flexibility when it comes to finding the right color temperature to make your bathroom feel more that much more luxurious and inviting. Looking to upgrade your bathroom lighting? Since opening its doors in 1974, Kenwood Kitchens has made a name for itself throughout Maryland as a complete kitchen and bathroom remodeling firm. With showrooms located in Lutherville, Abingdon, Columbia or Annapolis, Maryland, Kenwood Kitchens is the place for all of your kitchen and bathroom needs. We’re also featuring a special Wood-Mode savings event until December 30th. Don’t hesitate to give us a call at (800) 211-8394. This entry was posted on Wednesday, October 12th, 2016 at 10:22 am. Both comments and pings are currently closed.